It was only a matter of time before they were discovered by television producers. Not aspiring actors – we’re talking about local restaurants! 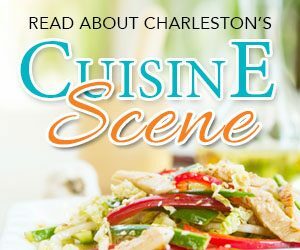 From food trucks to white tablecloths, many of the Charleston area’s eating establishments have been featured on food and travel shows for all the world to see. 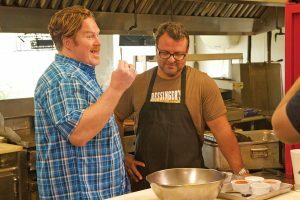 Fans of these shows often make it their mission to seek out the very same places – and dishes – that they’ve seen on the TV screen. But what about those tried and true places, ones that have been around for ages, that were always frequented by locals who knew them way back when? Let’s take a look at a few of those oldies-but-goodies and what is now bringing them fame. When world-renowned chef Sean Brock says this is his favorite place and whose food he strives to replicate, well, is there really anything else that needs to be said? 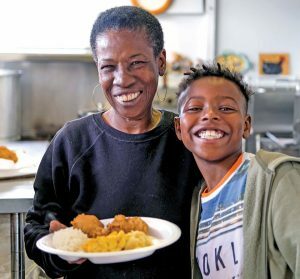 This “no-frills, all-taste” restaurant has been serving great food to locals for decades. But now that it has gained widespread prominence, tourists flock to the Morrison Drive location. Chicken is not the only star here. When Brock proclaimed on the Travel Channel’s “Bizarre Foods” that very few meals make him as happy as the chitterlings and lima beans, there was no stopping the floodgates of tourists and locals alike. As if that wasn’t enough, host Andrew Zimmern called the lima beans the “best pieces of food” he’d ever eaten. Martha Lou’s has added a second location at 2000-Q McMillan Ave. in North Charleston. It seems like new barbecue restaurants are opening everywhere these days, but many locals still rely on Bessinger’s for their fix of “liquid gold.” Beginning back in 1939, when it was a drive-in restaurant on Rutledge Avenue known as Piggy Park, this family-run establishment has kept generations of Charlestonians well-fed with its oak- and hickory-smoked pork smothered in its signature mustard-based sauce. The Big Joe and Little Joe pork sandwiches are synonymous with the restaurant’s identity. But Casey Webb of the Travel Channel’s “Man vs. Food” met the challenge of the Colossal Joe – a half-pound of barbecued pork layered with a serving of coleslaw and topped with brisket and a nest of onion straws. Ever since, tourists and locals alike have wanted to attack this beast themselves. The smorgasbord buffet section of the restaurant closed its doors to the public last year but is available for private group events. And folks can always find what Bessinger’s has made famous – and has now made Bessinger’s famous – at the restaurant’s sandwich shop and drive-up window. 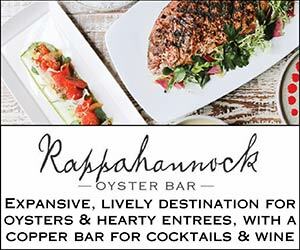 The name implies that this is a ship store for the many boats that drop by the City Marina on their way through the Intracoastal Waterway, but this place has been serving up Lowcountry fare to locals for over 50 years. 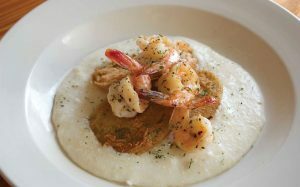 The shrimp ‘n’ grits with a side of fried green tomatoes was another breakfast favorite on this episode. The shrimp are sautéed and put atop the grits sans gravy so you get the full flavor of the local shrimp, fresh from Wadmalaw Island when available. To complete the seafood theme, the fried green tomatoes are coated with a crust of crabmeat. Collins demonstrated that the secret is to “smash” the crab paste into the tomato. Either of these dishes combined with the view is bound to get the day off right. 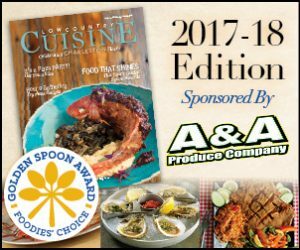 The Ambrose family’s farm on Johns Island has been the go-to place for fresh produce for decades, so it’s only logical that when “Cheap Eats” on the Cooking Channel featured the family’s restaurant, a signature dish would be tomato pie. 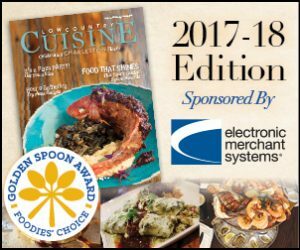 The homemade biscuit crust layered with bright red fresh tomatoes, dried basil and cheddar cheese hit the mark for Kahn, as he announced, “skip the french fries” and instead go for this Lowcountry favorite. 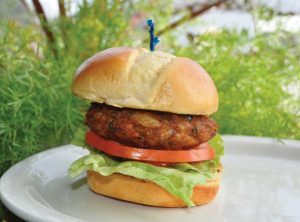 Kahn also ordered the crab cake sandwich, which has won awards for being one of the best in the United States. The young chef, Bradley Anderson, an Ambrose family member, demonstrated how he mixes in red and green bell peppers – locally grown, of course – to add a crunch as well as flavor. A crushed saltine paste seasoned with Old Bay gives the cake a perfect consistency. 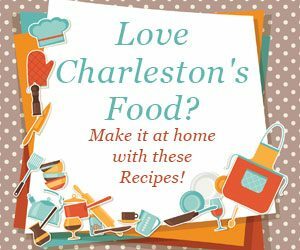 So while many prominent restaurants serving the new Charleston cuisine will continue to attract people from the world over, these four longtime favorites have introduced them to what locals have known all along – that it doesn’t have to be the latest to be a star.